Served as President of Mount Holyoke College, 1996-2010, previously Interim President of Wesleyan University. 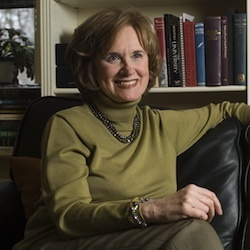 A distinguished scholar of American literature, past president of a leading liberal arts college, and former interim president of a top tier university, Joanne V. Creighton, Ph.D., is Haverford's new Interim President. She will hold the office while the College searches for its 14th president, a process that will unfold over the coming year. She has degrees from the University of Wisconsin (B.A. ), Harvard University (M.A. ), and the University of Michigan (Ph.D.). In addition to serving as interim president at Wesleyan University from 1994-95, where she had also been Vice President for Academic Affairs and Provost and Professor of English, Dr. Creighton was Dean of the College of Arts & Sciences, University of North Carolina at Greensboro. She has authored four books and dozens of journal articles and reviews. “I have long admired Haverford,” said Dr. Creighton, who praised the College for its“intellectual rigor and moral seriousness.” News of the search came as she was well into planning for the next phase of her career, teaching a course called“Following Faulkner” as a Five College Fortieth Anniversary Professor at the University of Massachusetts.“The more I learned through the search process, the more I was attracted to the opportunity to be part of what was clearly a powerful learning community and an extraordinary institution.” She succeeds Dr. Stephen G. Emerson '74, a distinguished stem cell biologist who decided to return to teaching and research following four years as president. Her appointment begins today, and Dr. Creighton plans to be on campus for several days over the next few weeks before beginning full-time duties August 24 when she welcomes members of the Class of 2015 and their families on move-in day. Dr. Creighton, her husband Tom, and dog Maisie will live in One College Circle, the home of Haverford presidents for more than half a century. They look forward to the December wedding of their son, Will, who currently lives in Arlington, Virginia.